Mr Nice is an Indica dominant strain that placed second in the High Times Cannabis Cup awards in 2004. It is named after the most sophisticated drugs baron of all time according to the Press – Howard Marks. Marks released his autobiography after his release from prison entitled “Mr Nice”. Mr Nice was created by the famous Sensi Seeds and has a moderate THC content between 13-16%. It is a cross of Government 13 with their hash plant and was originally called G13 x HP. It is a heavily Indica dominant strain to the tune of 80%. It started as a limited-edition strain but due to its popularity Sense Seeds continued the growth, to this very day, renaming the strain “Mr Nice” in 1999. Mr Nice is a very lazy and laidback strain of marijuana, even for an Indica dominant type. Despite the moderate THC content, it does have couchlock potential and the capability to induce appetite and a lack of motivation. It has the typical appearance of dark green buds with orange hairs, but its purple hues are a little more prominent that other varieties of Indica. It is recommended for use in the evening time as opposed to the morning or the afternoon. It is a creeper with a pleasant taste and flavor, commonly described as earthy and sweet. Why do Patients Use Mr Nice? 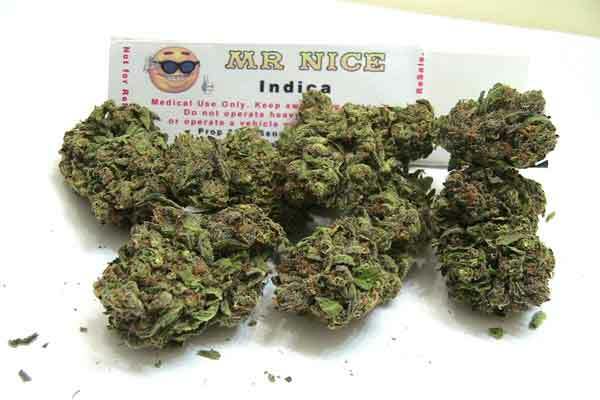 Mr Nice is a moderately potent Indica strain, with lots of uses. It has all the typical Indica qualities, in that it will effectively deal with insomnia, eating disorders and pain. It can also be used for general stress and anxiety. It is not the most powerful strain, and for more severe conditions it is best to engage in a more powerful Indica, Sativa or hybrid. But is it a good introductory stain and great for general rest and relaxation without being blown away. It is well known both medically and recreationally. Genetic lineage of Mr Nice unknown. Mr Nice has a rating of 8.3 on the stoned meter. THC content of Mr Nice is between 13-16%. Flowering time around 7-9 weeks. A strain that is much easier to grow indoors and does just as well. An indoor hydroponic or soil setup offers the best results. The dense plant should be topped early on to promote even growth, and then pruned heavily to keep foliage away from the base of the plant. Mr Nice grows between 4-6 feet. Mr Nice requires moderate growing experience. Mr Nice is susceptible to pests. Humidity and moisture can cause the bud to rot, so monitor the temperature and conditions of this plant carefully.